Never before have so many goods been exported than over the course of this decade. The global volume of exports has increased fivefold since 1990. 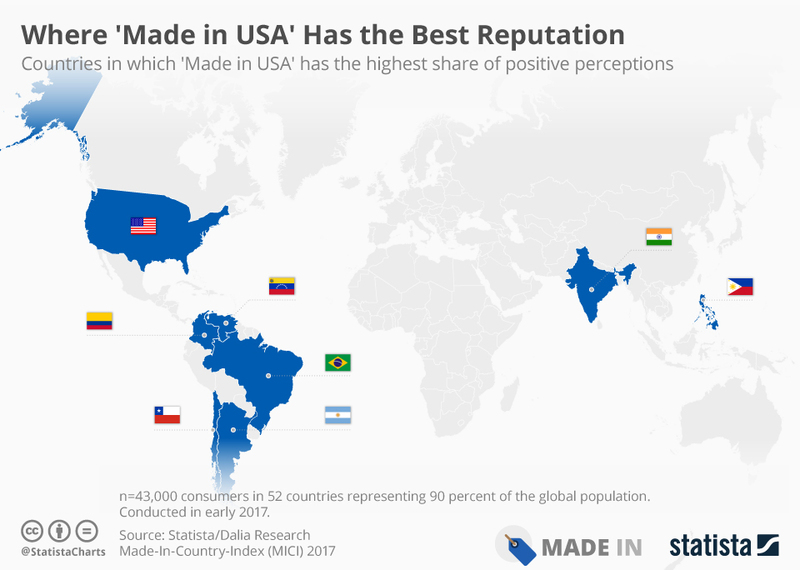 Statista, one of the world’s leading databases for business-relevant facts and information, sought to find out which countries around the globe enjoy the best reputation as countries of manufacture and exporting nations and therefore surveyed some 43,000 consumers about labels such as “Made in Germany” or “Made in USA”. The result is the Made-In-Country Index 2017 – a global ranking of countries and an indicator of the power of the individual nations’ brand images. Hamburg/New York/London, March 27, 2017 – “Made in Germany” is the most highly regarded quality label for goods and services around the world, outshining other major exporting nations’ trust marks such as “Made in USA” or “Made in UK”. This is one of the findings from Statista’s Made-In-Country Index (MICI). The global ranking of countries allows for revealing analyses of the image that countries around the world have of certain products. In early 2017, Statista, in cooperation with Dalia Research, surveyed over 43,000 consumers from 52 countries, in what is one of the world’s largest and most comprehensive studies on international trade. Statista thus establishes a reliable and comparable standard for the assessment of national quality labels, which will be updated over the coming years. The idea behind the index was to find answers to the following questions: How do consumers worldwide rate products from any other given country? Which “Made in” label ranks highest with global consumers? And finally, which countries are front runners with regard to single criteria such as design, sustainability, or price/performance ratio? Here are the results: “Made in Germany” takes first place and is therefore the world’s leading quality label. It was originally introduced 130 years ago in Great Britain to protect the nation’s market from cheap imports and warn domestic consumers of counterfeit products from Germany. Ever since then, the popularity of “Made in Germany” has risen steadily. Today it is more powerful than ever. The label’s first-place position is mainly based on the positive ratings in the product categories of “quality” and “security standards” along with the overall popularity of “Made in Germany” across many countries in the world: Germany holds the number one position in 13 countries. 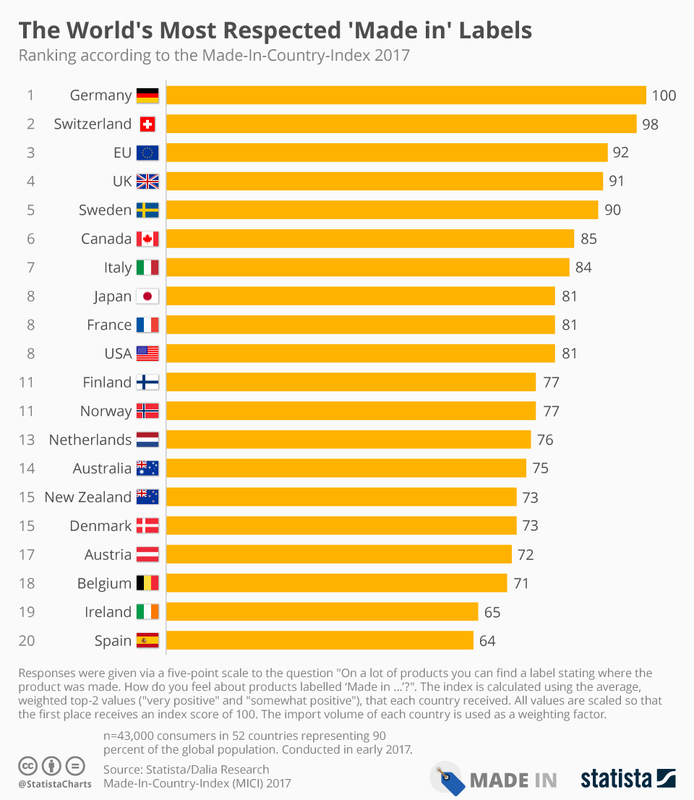 Switzerland is in second place and received very high ratings from around the world in the categories of “status symbol” and “authenticity” in particular. Italy excels with regard to design, while Japan received the best “advanced technology” ratings of all countries. China outshines others regarding “price/performance ratio”. The results for the “Made in EU” label, which was established as late as in 2003 by the EU commission, are in fact remarkable as it ranked third in the global ranking. “Made in EU” primarily owes its positive reputation to consistently high global ratings. Thus, not only consumers from European Community countries such as, for instance, Sweden and Great Britain, have faith in the label, but also respondents from outside the EU. “Made in EU” accordingly took top places in almost all South American countries (e.g. Argentina and Colombia). In total, the label made it into the top 3 eight times, especially due to its high ratings in the categories of “quality” and “technology”. This sum of high ratings compensates for the fact that it was ranked first by consumers from just one country (Algeria). The high-tech country USA, on the other hand, experienced a wholly different development. The world’s largest economy alone accounts for about ten percent of the volume of global trade. Recent news about the negotiations of free trade agreements, tariffs, or border controls were therefore hotly discussed. Moreover, projects that date back to the Obama administration such as NAFTA and TTIP are currently critically assessed. This may be one of the reasons why the United States of America did not make it into the top group of the Made-In-Country Index. All in all, the USA ranks eighth and are thus behind countries such as Great Britain, Sweden, and Canada. The United States is furthermore among those countries, whose global reputations have worsened the most over the course of the past twelve months. But the USA is not the only example of the fact that political upheavals do have a noticeable effect on the image of certain countries of manufacture. Turkey’s and Greece’s scores are also linked to recent political developments that damage both countries’ reputations. The MICI 2017 supports the assumption that countries do rate themselves highly. Germany, the USA, and Great Britain serve as examples as respondents from these countries rated their own countries highest (see world map). Neighboring countries, on the other hand, are often rather critically looked at: an example of low scores for products “Made in Neighboring Country“ is the rating for French products in Germany and the Netherlands, while “Made in China” ranks last in Hong Kong. In early 2017, Statista, in cooperation with Dalia Research, asked some 43,000 consumers from 52 countries for their judgements about of 50 “Made-in” labels (49 countries plus “Made in EU”). During the final evaluation, all data was weighted by volume of imports: ratings of US consumers, for instance, were weighted more heavily than those of Peru. Respondents represent 90 percent of the global population. All results can be found on https://www.statista.com/page/Made-In-Country-Index. Statista GmbH operates Statista.com, a leading data and business intelligence portal. Statista provides its customers with considerable efficiency and cost benefits with regard to locating business-relevant information, primarily in the form of statistics, on a single highly-relevant platform. The portal offers a vast pool of data in German, English, French, and Spanish, which is collected in accordance with customer needs and expanded on a daily basis. The platform today already gives access to some one million statistics from over 18,000 sources covering more than 600 industries and offers – in three equal parts – data from Statista’s own collections, data from partners, and data from publicly available sources. Based on this data Statista constantly develops new, innovative data-based products such as, for instance, national rankings (e.g. “Best Employer”, “Best Law Firm”, etc.). Furthermore, Statista designs up-to-date infographics to the specifications of its customers. For more information about Statista please visit www.statista.com. Founded in 2013 and headquartered in Berlin, Dalia harnesses the app economy and advanced data science to distribute millions of micro surveys worldwide to gather and analyze real time data on consumer attitudes, public opinion and market trends. Backed by some of Europe’s leading venture capital firms, including Balderton Capital and Wellington Partners, Dalia has generated over a billion answers from people spread across 96 countries with the resulting data cited in over 2.000 news articles globally (www.daliaresearch.com).